NY Times: "Microsoft's huge profits - $6.7 billion for the past quarter - come almost entirely from Windows and Office programs first developed decades ago. Like G.M. with its trucks and S.U.V. 's, Microsoft can't count on these venerable products to sustain it forever. Perhaps worst of all, Microsoft is no longer considered the cool or cutting-edge place to work. There has been a steady exit of its best and brightest." - I never thought I'd see this happen to Microsoft. When we moved to the Seattle area in 1993 it was a hotbed of software development, and Microsoft was probably the most desirable place to work. Now it's a second-tier destination. It's still a great place to work, just not what it used to be. Another choice quote from the article: "Another example: When we were building the tablet PC in 2001, the vice president in charge of Office at the time decided he didn't like the concept. The tablet required a stylus, and he much preferred keyboards to pens and thought our efforts doomed. To guarantee they were, he refused to modify the popular Office applications to work properly with the tablet. So if you wanted to enter a number into a spreadsheet or correct a word in an e-mail message, you had to write it in a special pop-up box, which then transferred the information to Office. Annoying, clumsy and slow." - That VP was none other than Steven Sinofsky. We had plans to make Visio a world class citizen on the tablet, to really embrace it, but Sinofsky didn't like it, so the plans were flushed. I have a dear friend that led that effort, and after many years of watching Microsoft make strange decisions, he's finally left the company. He'll be a great hire for a company that's interested in creating a truly great user experience. James Robertson: "We just picked up an XBox this fall, and I signed up for Netflix not long after that - for a flat monthly fee, I can stream a whole bunch of content whenever I feel like it. Apple just bought a streaming outfit (LaLa), so it seem slike they know where things are headed, too." - I know James is posting about something else, but he hits the nail on the head when it comes to the XBox Live/NetFlix deal. Kim and I have become addicted to this lovely service. We've just finished season one of Dexter and are off to season two. After one of our Dexter marathons I scrolled through the movies and television shows available to us via instant queuing and was shocked to find a great many options. Bravo NetFlix, bravo Microsoft. Pairing XBox Live with NetFlix was a win for both companies, and fulfills this movie fanatics dream of video on demand, and I think we've only scratched the surface. Things are only going to get better. Joel on Software: "With 93,000 employees, nobody ever talks to anyone outside the company, so it's no surprise they've become a bizarre borg of 'KT', 'Steve B', 'v-team', 'high WHI', CSI, GM, BG, BMO (bowel movements?) and whatnot." - This leads to one of the things I absolutely hated while I was at Microsoft. They referred to people by their e-mail addresses. E.G. I would be 'robf' to people. It's so impersonal, definitely Borg-like. Go read the job description, I can't make heads or tails of it. It's definitely an internal post. Side note: I love that Microsoft has CSI's, Crime Scene Investigators. Don Dodge: "The Google campus is beautiful, funky, and efficient. There are bicycles everywhere for people to use to get between buildings. In some ways it feels like a college campus, but the intensity level is much higher. Most people sit in open cubes with four or more people in a pod. Offices with doors typically have 2 or 3 people in them. People work in groups and there is a real sense of teamwork everywhere you look." - Very different from Microsoft, in so many ways. Some folks thrive in Google environment, some in the Microsoft environment, and there are cases where people cannot make the transition from home to another. It looks like Don is thriving. I think in the near future there will be docking stations everywhere with a screen and a keyboard. Don is referring to your phone becoming your primary computer. Think about that for a couple of minutes. When I saw the iPhone for the first time that thought came to mind. John Gruber: "Hardware and software both matter, and Apple's history shows that there's a good argument to be made for developing integrated hardware and software. But if you asked me which matters more, I wouldn't hesitate to say software. All things considered I'd much prefer a PC running Mac OS X to a Mac running Windows." - Very interesting. There was a time, not so long ago, when you could essentially buy a "PC" running Mac OS, but Steve Jobs killed that off when he returned. Much to the benefit of Apple. It is kind of weird to see a Mac die hard make a statement like that. I'd still like to see the Mac OS X UI and services on top of Microsoft's NT Kernel, which has a bad reputation because of decisions made to support legacy behaviors. Anyway, the NT Kernel is a very good OS Kernel. It would be interesting to see other UI looks on top of it, and yes, that is possible. Mini-Microsoft: "You know, we have people working for Microsoft (or, at least did, I don't know, maybe no longer) responsible for driving executive leadership education and growth at Microsoft. This is their friggin' job. Develop Microsoft Leadership at the executive and L68+ levels. So, has anyone hemmed and hawed in-front of Mr. Ballmer and mentioned that this nickel and diming layoff approach is at the worst case end of the layoff management scale?" Don Dodge: "Thanks Microsoft, I'm going to Google! Vic Gundotra at Google was the first one to contact me with an opportunity... 90 minutes after the news of the layoff hit. That fast decisive action was refreshing, and such a contrast to the slow, secretive, bureaucracy at Microsoft." - Ahhh, yes, Microsoft is cleaning house. Along with the dead weight they're going to get rid of some good folks. I can assure you, Microsoft does NOT value experience, at least that was my experience. They like hiring young, bright, kids they can run in the ground. Then when you mature and realize you have more important things in your life, like family and friends, and stop putting in 80 hours a week, well, they're done with you. Time to move on, for the better. Microsoft has lost quite a bit of its' former luster. It has grown into the hard to navigate ship, Titanic like. The still produce great stuff, don't get me wrong, but they're no longer the nimble company they used to be. I'm sure Don will find Google a very different experience. PCR: "One of the things that people say an awful lot about the Apple Mac is that the OS is fantastic, that it's very graphical and easy to use. What we've tried to do with Windows 7 - whether it's traditional format or in a touch format - is create a Mac look and feel in terms of graphics. We've significantly improved the graphical user interface, but it's built on that very stable core Vista technology, which is far more stable than the current Mac platform, for instance." - I will always claim the Kernel of Windows is solid, I have for years, and I honestly believe it. Is it more stable than the Mac? I do doubt that. I do find it interesting they point out they're trying to make the experience more Mac like. That can't hurt them. The Mac is still my favorite platform, with Windows holding at second place. Robert X. Cringely: "Here's another piece of evidence aiming in the same direction: have you actually done a Windows 7 upgrade? Mine took seven hours! It shouldn't have to take that long unless part of the goal was simply to discourage upgrading. Snow Leopard took me 20 minutes to upgrade, but then Apple has no OEMs to please (this is key) and makes lots of money on upgrades even at $49.95." John Gruber: "Apple made news this week for the design and tech specs of its all-new iMacs, which start at $1199. HP made news this week for unveiling a Windows 7 launch bundle at Best Buy that includes a desktop PC and two laptops, all for $1199. That might be great for Microsoft, but how is it good for HP that their brand now stands for bargain basement prices?" - That pretty much says it all. Our family has converted. Both daughters are Mac users, I use one. My wife still has an HP laptop, but that will change with the next purchase. She will become a Mac user. Our next family desktop purchase will be a 27-in iMac, no doubt about it. It's odd, isn't it? I make a living writing software that runs on Windows. I still know that platform best. The real trick is switching to writing code for the Mac all day, every day. There's the real challenge for me. John Gruber: "Microsoft's irrelevance in today's mobile space is nothing short of a spectacular failure. Worse than the mere fact that Windows Mobile 6.5 is a total turd is that no one is surprised, and no one cares." - The Mobile team has fallen so far behind. Time to let those Danger guys have a shot at building a new user experience. Forget the Windows heritage, build something different. Of course you can start with the existing code base, makes sense, but put a new shell on top of it. Make the UI fit the device. The Windows logo menu system needs replacing for starters, it really doesn't fit. I suppose it's a branding thing, come hell or high water, I suppose it'll stay. In some way it's very strange. The OS seems to be a bit outdated, yet it's used on a ton of devices? Microsoft must be giving it away and guaranteeing a certain amount of support. If not why wouldn't these guys switch over to the FREE Android OS? They can do with that whatever they want. Maybe it comes down to support? Who knows? XBox.com: "Avatars have seen lots of love! Check out the new Marketplace and Avatar Props. The Avatar Marketplace will be available on Xbox LIVE starting August 11 as part of the Xbox LIVE Update. You will be able to browse and purchase Avatar apparel through the Xbox LIVE Marketplace on the Web starting August 13." - I think Microsoft is beginning to understand this whole social media thing. They've finally discovered that people will pay a premium for silly stuff, like being able to outfit their Avatar's with clothing from name brand vendors. Now, can you imagine, being able to buy popular clothing, like Ed Hardy, for you Avatar? While I don't care to spend money on stuff like this there are people out there that will drop a pretty penny on it, as silly as it sounds, it's true. geek.com: "In total four adverts were made with Dean Cain starring in all of them and proclaiming IE8 can solve many of the problems regular users have when surfing the Internet. The reception the adverts got has been mixed, but it is one video in particular users either found funny, offensive, or off-putting." - I thought this was some sort of joke, put on by some random joe blow making fun of Microsoft? I finally saw it. Microsoft paid someone to shoot this crap, and then used it? Why is it the worlds largest, and by all accounts, most successful software company in history can't make a decent commercial? I like the new Bing commercial, it's funny, and gets the point across. But how does a wife throwing up on her hubby get the point across about a feature in the browser. I know my wife would probably vomit if she saw it. Gizmodo: "The device is tighter and more physically beautiful than the iPod Touch and it's got a better UI, the main menu's scrolling so natural through the swipe gestures. There's a little note on the side, under the volume toggle-"Hello from Seattle." The power button is up top. The home button is nice and prominent, a bar rather than a round button on the Touch. It's smaller. And the accelerometer is more swift in responding to repositioning; images rotate very fast." - The Zune HD does look very nice, at least from the pictures. There are some interesting things to note. It's obvious the idea was to steal some thunder from Apple's iPod Touch/iPhone momentum. Apparently they support touch gestures. It doesn't appear to have applications, beyond what Microsoft will provide? They even did something Apple has always done. When you buy an Apple product you get the "Designed by Apple in California" slogan somewhere on the device. Now Microsoft has swiped that for the Zune HD by placing "Hello from Seattle" on the side of the device right under the volume control. It's interesting they'd choose to use Seattle. Last I checked Microsoft was located in Redmond, WA? I know, I know, Redmond isn't as cool as Seattle so it makes sense. Heck, Microsoft wouldn't even allow the Visio team to remain in downtown Seattle because it was "too far away" from the mother ship. Hey, if you can't beat 'em, join 'em. Mini Microsoft: "And you know, speaking of The Commons: I trekked over there today (meh, not the sunniest day) and I have to say it's an impressive space. I walked around admiring the scope of the project, thinking "This is what Windows built. This is what Office built." I then reflected on the irony that it's Mr. Robbie Bach's Entertainment and Devices moving into the new campus with The Commons. Windows and Office funded this extravagant place for the folks who managed to burn through $8,000,000,000USD+ on the Xbox, be shown how it's done right from Nintendo with the Wii, dash the Zune against the juggernaut iPod, and have the iPhone drop-kick WinMobile to Mars." - I've heard nothing but great things about The Commons, but the big news in this post may be the coming layoffs, 3,600, in the next 10 days? Read the first comment. It will be interesting to watch this unfold over the next week or so. I keep forgetting to write this down, so it's going on the good ole weblog for searching later. If you have your code setup to do heap allocation tracking, _CTRDBG_LEAK_CHECK_DF and you'd like to break on a specific allocation, here's what you do once you've started debugging. Add the following to the watch window. Set the value to the allocation you'd like to break on. Now, if you're using the multi-threaded DLL runtime you'll have to provide a better context to the debugger. Like this. So, if I'd like to see who allocated a hunk of memory, they were the 1000th caller, and they didn't free said memory, set the value to 1000, and the debugger will stop on allocation 1000. Article on MSDN with more details, How to: Set Breakpoints on a Memory Allocation Number. Gizmodo: "News doesn't get much worse than this for the Zunes and Sansas of the world: a whopping 0% of surveyed teens planned on buying their devices, with 100% wanting an iPod in the coming year." - Does this actually surprise anyone? Apple embraced Windows as a platform for their player, does Zune do that? I believe the answer is no, and I honestly think that is one of the key reasons iPod sales went through the roof. Remember, the iPod became a wild success before Mac sales started taking off. It's funny how things change. I had a PC laptop and a Toshiba Gigabeat player. Now I love everything Apple. Mac laptop and two iPod's, a Shuffle for working out, and an iPod Touch for everything else. The Touch is more of a mobile computing device for me. I check e-mail, tweets, and news feeds, and to top it off I stream music through it via Pandora. It is in a word, incredible. Harry Pierson: "The Visual Basic team has a long history of delivering great value to our customers, and we are continuing that in the Dev10 release of Visual Studio. We're looking for a Development Lead to help guide these efforts as well as shape future versions of the compiler." - If I were a brainiac, and a bit of a masochist, I'd be all over this sort of opportunity. My first real programming job was using Microsoft Basic 6.0, awesome compiler, great language, so it's near and dear to my heart. Back in those days we were fortunate enough to get betas of Visual Basic 1.0. Ahhh, Classic Visual Basic. Scientific American: "It's official, Microsoft's Windows Vista operating system gets the prize for being the most overhyped, underperforming information and communication technology (ICT) project. Windows Vista garnered 5,222 of 6,043 votes (86 percent) entered via the Web to snag top honors in the first-ever Fiasco Awards announced in Barcelona, Spain, today, beating out other contenders, including Google's Lively virtual world, the One Laptop per Child computer (developed by the Nicholas Negroponte-chaired One Laptop Per Child Association, Inc.) and Second Life." - Usually being numero UNO is a good thing, not so much in this case, but do not count Redmond out of the running. Sinofsky will turn things around and Windows will once again be a good operating system. My only gripe about Windows 7 so far is it looks too much like KDE, why oh why would you want it to look like a Linux Desktop UI? We have some time so hopefully they rectify that mistake. Beyond the look and feel I'd expect it to be rock solid, and perform, this time around. MacWorld: "The real market momentum with operators and the real market momentum with device manufacturers seems to primarily be with Windows Mobile and Android." - Maybe that's so, I'm not sure. Microsoft licenses Windows Mobile to all comers, so it would make sense that their numbers are good, as long as they have licensees. Apple is #1 in the hearts and minds of developers, and users, and they're leading the way in new device sales. Not a bad place to be. Mini-Microsoft: "BillG is long gone. Within our leadership, there's no one left who wants to read your ThinkWeek paper, so they're killing that off. In our future, employee-led innovation, I guess, starts at Level 68." PC Pro [via Steve Mitchell]: "Microsoft has defied the clamour to release a single version of Windows 7, by announcing six different SKUs for the next-gen operating system." - Hey, it'll be a win if they do one thing. Give the low end, limited capability, away for FREE. It's clear Microsoft has really lost their way as an industry leader. Fire some of those MBA types making these decisions, get in touch with your users, and scratch and claw your way back to the top, like a real company would. IBM turned it around and so did Apple. I think two would be sufficient, Client and Server. Oh, and giving that Limited Capability version away for nothing. That would rattle some cages. I'll give you the same line you gave third party .VBX/.OCX vendors when you shipped their controls with VB. "You can get them to upgrade to the full version by giving them the low end version for noting, but we'll get your name out there." That advice sounds just as bad now as it did then. Don't get me wrong. I don't hate Microsoft, I just don't understand where they're going. Mini-Microsoft: "I wanted intelligent, well-thought-out leadership to have seen long ago that we've doubled our ranks far too fast and exceeded our ranks beyond what we can sustain (let alone need). Yet here we are now, in the choppy waters of the global economic crisis, being reactive rather than opportunistic." - Read through the comments, they're always very interesting. I wonder how many rock stars will leave of their own accord because of the impending gloom that will descend on the Microsoft campus? Maybe some, hopefully not many. Microsoft is a strange place to work, but it's full of interesting work all at the same time. It's hostile, but technically challenging. I mostly enjoyed my time there as an employee, mostly. The perks/bennies are unmatched in the industry. I wonder how much of that will change? Will insurance for the employee and family continue to be covered at 100%? Will the free beverages continue? What about the towels? Keep the talent happy. Is it AIR, Flash, Flex, ActionScript? The Flash Blog: "Ok so those are some of the words that will take on new definitions. There are also terms that will either change or go away completely. For instance, what should I say when I want to refer to the Flash authoring tool? Well stay tuned from Adobe on that one. For now I will specifically either say the version, as in Flash CS4, or just call it Flash authoring. As you may have heard from various sources, Flex Builder may soon be undergoing a name change. This makes total sense as the IDE is used for much more than just developing for the Flex framework. Stay tuned as we continue to roll out new pieces of the Flash Platform re-branding effort." - I've got to be honest and say, this is super confusing. On .NET Microsoft has done a good job separating terms. The CLR is the runtime , it is the machine. The .NET Framework is, well, the framework you build on top of; access to the OS, Collections, etc. Language terms are clear, we have C#, VB.Net, IronPython, IronRuby, and a host of other languages. We also have an IDE called Visual Studio. So I could say "I built that on .NET, using C#, and Visual Studio". I have no idea how you describe that in the Adobe AIR/Flex/Flash/ActionScript world? Would it be "I built that on AIR, using ActionScript, and the Flex IDE. ", or something else all together? I've been mixing AIR and Flex to mean the scripting language all week. I'm fairly certain AIR is equal to the .NET CLR? Oh, and where does AIR fit into "Flash is being redefined?" Hopefully we'll get some clear terms from Adobe soon, then maybe my pea brain can understand how everything works together. Mini-Microsoft: "Rumors. Microsoft layoff and cut-backs and Reduction In Force rumors. That's all I have for you. Rumors and second-hand speculation and the comments left by the fine, good-looking folks who participate in the conversation here. So pour yourself some holiday cheer and dive in." - Mini may finally get what he's wanted all these years, a reduction in force. The comments tell the story so make sure you read through those. I love Visual Studio. I need a little badge I can wear around that says "I (heart) Visual Studio!" I do, I really, really do. But... and there's always a but isn't there? The latest release seems to have really gone the wrong direction for the C/C++ developer, in my humble opinion. Editing, debugging, all great. The problem seems to lie in the auto completion/browsing capability. It's horribly slow. This morning, after 30-minutes, I finally had to kill off Visual Studio after right-clicking so I could "Go to Definition" of a method. Yes, I had other stuff to do so I left it alone hoping to come back and the hour glass disappear so I could work, no luck. Nuke it. So, here I sit, waiting on a build to complete, and I make the mistake of right clicking on method name again. The IDE is now out to lunch, sorry Rob, no right mouse clicks for you, and you can forget ever seeing that menu you'd like to see. Thing is I'll bet the C#, and Visual Basic crowd, are pretty pleased with it. All those nice little pop-up tool-tippy style helpers that allow you to dig into objects to inspect their values is pretty darned nice. Too bad it comes at the expense of the C/C++ side of the equation. Maybe, just maybe, there are some settings I'm not aware of that will allow me to get better responsiveness from the bits I do like? I'll need to dig around and see if I can turn off some stuff to improve performance. PPS, it's still better than Vi, emacs, and gdb on Linux. Heaven forbid I have to work in that all day, every day. PPPS, Note to the Linux world. Check out the great job the XCode guys did on their IDE. It uses gdb under the hood and allows you different views of the debugger, gdb console view and a nice GUI view that allows you to set breakpoints interactively. PPPPS, I need to look at KDevelop again. Maybe it's much better than I give it credit for. Harry Pierson: "This is a very pretty sight. It’s a screenshot from the IronPython CodePlex home page showing that 2.0 is the 'current release'. Yes that’s right, dear reader, IronPython 2.0 has officially been released!" - The dynamic language guys have been doing a great job, we have IronPython, IronRuby, and the DLR thanks to them. Well done, and congratulations. James Robertson: "The next time someone claims that C# or Java are 'easier' because they use 'standard C style syntax', this is worth pondering: a comment I saw pass by on Twitter" - Wow! When I read that I thought to myself, No way there's that many keywords! Well, I was wrong. According to this page there are 77 keywords and 16 contextual keywords. I really hope C# doesn't continue to become a dumping ground for features. Like LINQ support, why? Sure it makes the code look a bit cleaner, I guess, but why add that directly to the language? I thought that's why the CLR is open? So someone could come along and create the "Database Programming Language" and it magically works with the other .NET languages? Michael Hunter: "Take, for example, the coding you will almost certainly be asked to do. I have never had anyone complete my coding question. This does not bother me. I do not care whether the person I am interviewing knows C# inside and out if they haven't a clue how to solve problems they have never seen before. Nor I do care (much) how awful their code is so long as I feel their approach(es) to solving the problem is effective." Engadget: "Microsoft is expected to be handing out pre-betas of Windows 7 to devs at WinHEC and PDC soon, and it looks like it's settled on an official name for its next-gen OS -- ahem, Windows 7." - It's about darned time they went back to using version numbers, I never liked the year model naming and the goofy, meaningless, names like XP and Vista needed to go. I like the idea. I'm officially a Mac fan, can't help it. The user experience it just too good. The OS is clean and most of the applications I use on a daily basis are very clean. However... I just couldn't live with one application, OmniGraffle Pro. No offense folks but it's not Visio. For some that will be a plus, for me it's a definite minus. I missed Visio so much I went out and purchased my very own copy to use on my work box. I installed it yesterday and got to work on a new drawing, it worked just like I remember. I installed Windows XP SP3 yesterday only to discover they've removed something I use every day. It's a little thing, but why they'd remove it is beyond me. I'm talking about the Address Bar. You know the one you can show down in the Task Bar that allows you to type a drive, directory, network share, or URL and it pops open Explorer to let you browse. Like I said, little, but why remove it? Ah, according to this TechNet post, they had to remove it due to legal restrictions. It's been there for how long, and now there are legal issues related to it? I don't think this will make me upgrade to Vista guys. In the end I only use Windows XP as a development tool, it allows me to do my job, but it's no longer my platform, or OS, of choice. Mac OS X is my OS of choice today. I need to get a job writing code for the iPhone, or OS X.
UPDATE: I've found a replacement to the Address Bar, it's called MuvEnum Address Bar, and it's free. I'll try this for a while and see how it goes. 9 to 5 Mac: "And it gets better, 'I'm not saying there isn't a threat' from Apple, he said. But if Microsoft and its PC partners 'do our jobs right, there's really no reason Apple should get any footprint in the enterprise.'" - Time for Steve to go bye-bye, he's lost his marbles, but then again he is getting spanked by the other Steve. But what do I know, I'm a great big nobody. James Robertson: "Microsoft's response to this kind of thing seems to be an utterly stupid advertising campaign. I fully expect Microsoft to get a lot smaller before they find their mojo - pretty much just like IBM back in the 80's. I especially like the rationale HP gives for this effort:" - I think James really nails it here. Microsoft needs to get refocused, and to do that they'll probably have to take a big hit to do so. I still believe the Windows Kernel (NT) is a rock, but maybe it's time for a radical change above, and I don't mean change the paint on the shell. If HP is really off doing their own OS Microsoft needs to make sure it's built on top of the NT Kernel. It's completely capable of having different looks placed on top of it. Remember the OS/2 shell that lived on top of it for a few releases? Engineering Windows 7: "In fact as I type this I received sequential emails one saying “[N]obody cares about touch screen nonsense” and the other saying “[Win7 needs] more advanced/robust ‘touch’ features”. When you just get unstructured and unsolicited input you see these opposites quite a bit. I’m sure folks are noticing this on the blog comments as well." - The real hidden nugget in that comment? If memory serves, Sinofsky hated the tablet from day one and since he ran the Office unit he didn't care to add great table support to the Office apps. Visio could've been the premier application for the tablet but it wasn't allowed to be. That's ok, business decisions and all, but now Apple has entered the market. Touch is in, and Apple will perfect it, while Microsoft allows it to possibly die on the vine. Strange, isn't it? It's not always the leader into the market that wins, it's the guy that can bring it home in the hearts and minds of users. CNet | The Open Road: "Columnist John Dvorak thinks that Adobe Systems has a Microsoft problem and that Linux provides a clear solution:" - This has already been done for Adobe, it's called Mac OS X. Now, the one cool thing about this idea is simple. If Adobe developed their own Linux OS we'd finally get a real end-user version of Linux. Do they need it, no, would it make for interesting choice, yes. If they did it I'd toss out KDE and Gnome, and start from scratch, freshly grown shell from the ground up. Keep the kernel and all the nifty hidden stuff. Add real developer tools, Xcode is a tremendous IDE that makes use of the open source toolchain, gcc and gdb. Linux doesn't have to be for the hacker only. I work with a few guys, hi Tony and Stuart, that make Linux sing, but 99% of the population don't care to hop into BASH and type arcane commands to get what they want. They want to point and click. With the proper focus, and a world class company like Adobe, they could make it happen. Problem is, it doesn't really make sense for Adobe. They're all about their applications running across OS'es and making money, not creating the OS. It would sure be fun to work on! But, it doesn't really make sense. Engineering Windows 7: "Welcome to our first post on a new blog from Microsoft—the Engineering Windows 7 blog, or E7 for short. E7 is hosted by the two senior engineering managers for the Windows 7 product, Jon DeVaan and Steven Sinofsky. Jon and Steven, along with members of the engineering team will post, comment, and participate in this blog" - I'm not sure there's time to include any feedback from this weblog for Windows Seven? If there's any talk of a new OS I'd start with the Windows NT Kernel and build from there, new API's, new shell. Maybe managed? Yes, it'll take years, if they decided to do it. Simplify, simplify, simplify. Apple proved it could be done and OS-X is elegant and powerful. They also managed to prove you could hide great power under a beautiful UI. The Linux crowd could learn something from that. Wow, I just ran into a really freaky behavior in Visual Studio 2008. I'd set the Configuration Properties > C/C++ > Output Files > Object File Name to a custom path, and I forgot to include the trailing backslash, which caused me all kinds of grief. Basically the compiler happily created one file with the same name over and over and over and was actually able to successfully link, not sure why that worked, but it did. So when I went to link to this particular library I'd get a whole mess of unresolved external references. I finally saw my problem this morning. So, word to the wise, remember the trailing backslash. Yes, this was a user error, but it was sure very easy to make that mistake. One interesting hit on Google produces this, a bug report marked as By Design. If you look in the comments for the report you'll see two comments saying it's still around. Why, yes, yes it is, and I'm experiencing it. Hopefully I'll be able to find a workaround, or a fix for it, and soon. It's strange it's only happening for this one particular codebase, I've been building other things with Visual Studio 2008 for a while now, without issue. Time to dig around a bit. IT PRO [via NerdyNews]: "All the components are in place – Windows Mobile as the underlying OS, the Zune user interface for the front-end, tweaked and extended using the team and technology at Danger (the company behind the front-end ssoftware for the Sidekick smartphone, which is based on Windows CE)." - I had a feeling something like this would happen. I have a friend there that said he was working on a "really cool" bit of mobile technology he couldn't talk about, but when I said If you're working on a device that plays music, you have a big hill to climb, and I hope you do a lot better than the Zune things got real quiet. That and the iPhone and iPod are a huge success. Well, like I said, good luck with that Microsoft. There are a bunch of iPhone wannabes showing up now and I'm sure they're not fairing very well. In a way Microsoft has become the underdog even though they still own a gigantor share of the PC market. Apple recovered, but Jobs had to come back to do it. Jobs brought focus back to the company. Microsoft is just doing too much. They need to focus on something and get their mojo back. I'm not sure a new smartphone platform is it. BBC: "Microsoft, Apple, Adobe, and the rest, offer you software that gives them power over you. A change in executives or companies is not important. What we need to change is this system." - This guy is a complete nut job. He wants to trade paid software for free, why can't we have both? There's nothing wrong with someone making a living writing software and there's nothing wrong with giving your software away. You choose, but quit banging the drum for everything to be free. There's a price to pay for free software as well. I can't hack up Linux and sell it without making those changes available to everyone, right? Where's the freedom in that? It forces me to give away the changes that make my system better. That's not freedom, it's a dictatorship. I'm not against free software, I do, however, have a problem with people telling me what I can and can't do. If Open Source software were truly open I'd be able to distribute it in whatever form I see fit. I know there are licenses that allow this sort of distribution, but Stallman's idea of open isn't one of them. Have Mac will Blog [via James Robertson]: "For all OS X’s excellence, it should be remembered that OS X is a good deal younger than Vista, with the Mach microkernel sitting under BSD and a coherent interface layer sitting above it. Windows has archaelogical layers of software buried under the covers, because Microsoft chose to provide a great deal of backward compatibility." - That statement is only partially correct. NT began life in 1989, Mach in 1985. The NT Kernel is newer. As to the backward compatibility layers on top of an otherwise excellent kernel, well, he's right there. If Microsoft were to create a new OS they should start with the NT Kernel and go from there. Microsoft could survive creation of a new OS, just as Apple did, and they can be heroes on the other side. Keep the Win32 API's in the OS as a compatibility layer, just as Apple has Carbon, and introduce the "new" way to do things, slowly turning developers to it, with a conversion deadline of a number of years, say ten. If you remember back to the initial release of NT it included two shells, Windows and the OS/2 shell. Yes, you could put a new UI on top of NT. I used to know the complete details, but my old brain is failing me at the moment. In a nutshell Microsoft could strap the .NET runtime up on top of the NT Kernel, as the new API, just as Apple did with Cocoa, and move toward a much easier development model. Of course that's a big oversimplification of the real work, but they could do it. There's no doubt Windows is carrying around old baggage, but the OS as a whole is not a complete loss as folks would lead you to believe. Sara Ford: "To create an alias, open up the Command Window (or anywhere you can type in VS commands) and type in something along the lines of..." - I've always wondered how to use the Command Window, but I've never taken the time to look into it, much less use it. I love the the alias "? ", shades of Classic Visual Basic. MSFTextrememakeover: "It's sobering to realize that during Ballmer's term as CEO, MSFT has underperformed almost all of its top tech peers (including AAPL, IBM, HPQ, SAP, INTC, CSCO, SYMC, NOK, ORCL, ADBE, RIMM, QCOM, Ebay, and AMZN), and badly lagged the major averages. We may even see our third plunge to test the 2000 lows during his watch. Unbelievable." - So long Mr. Makeover, it's been nice reading ya. Microsoft should take a page from Apple's playbook, streamline the OS, go work on the guts, forget adding features, in fact it might be a good idea to remove a few! twitter.com/john_lam: "ironruby running unmodified rails!" - That's pretty darned sweet. Update: John Lam: "IronRuby doesn’t just let you run Rails; it lets you interact with the rich set of libraries provided by .NET. You’ll be able to use IronRuby to build server-based applications that run on top of ASP.NET or ASP.NET MVC. You’ll be able to use IronRuby to build client applications that run on top of WPF or Silverlight. You’ll be able to use IronRuby to test, build and deploy your .NET applications. You’ll be able to run Ruby code in your web browser and have it talk to your Ruby code on your web server. That’s a feature that we feel that many folks will enjoy." - Wow. BBC: "Microsoft's next operating system will come with multi-touch features as an alternative to the mouse." - It's surface, in a smaller size! ars technica: "Handfuls of Windows Vista Media Center users found themselves blocked from making recordings of their favorite TV shows this week when a broadcast flag triggered the software's built-in copy protection measures." - Microsoft's bad karma continues. Will they ever stop the bad press? With each new article I think to myself "It can't get any worse than this", and then it does. By the way, can't you record shows on a TiVo without restrictions? That's an honest question, I don't own a recorder. John Nack: "Mark is not going to go work on other digital imaging tools. After 17+ years of driving Photoshop & subsequently Lightroom, he's looking for a complete change of pace & wants to work on operating system technologies related to user experience. Given that Mark has always been a huge Mac guy (developing Lightroom first on the Mac, etc. ), it's kind of a Nixon-goes-to-China moment." - What's bad for Adobe is good for Microsoft. Mark has the opportunity to make the Windows user experience better. With the sad state of Vista, there's nowhere to go but up. James Robertson: "Ultimately, this is a conservative offering aimed squarely at Microsoft's installed base. There's nothing wrong with that, and it might well help to retain that base in the 'paying customer' column. It's hardly game changing though." - Mesh isn't bad, it isn't great, it just is. It's not something that'll make me go out a purchase Vista, or a Windows Mobile device, just so I can keep everything in sync. If I already have an investment in the Windows platform it may prove useful, but it's not an earth shattering, must have, technology. Hey, now could be the time to join Microsoft if you have great ideas. They're losing ground rapidly and could use some new, innovative, thinking. MacWorld: "What this means is that after 31 August, music fans who want to shift their sounds from one computer to another will be blocked from doing so. It also means that once all five Windows PCs a user can have authorised for music playback have failed, they will lose their music." - So, you have the Vista debacle, iPod rules the roost, the Yahoo! acquisition is going well, and now you're going to shut down people who legally purchased music from you? Wow. On the bright side, there's always Mesh? This company seems to have things figured out. DotNetGuru.org: "The Dynamic Language Runtime (DLR) is a layer on top of the .NET Framework 3.5 aiming at help you to build dynamic languages in .NET. Languages created with the DLR could be a language embedded in an application (like before) or a new language for the .NET platform like IronPython or IronRuby provided by Microsoft." Ok, it's a strange idea, but what do you expect for free? Who knows, maybe you can already do this, and I'm just so out of touch with Windows development, and Visio, I've missed it? Wouldn't it be nice as a Visio developer to be able to perform queries against a drawing, page, or shape? Harry Pierson: "We've hired a few people around here recently (including me obviously). However, if you have a burning desire to work on IronPython (or IronRuby) and Visual Studio, we're still hiring" - This is exactly what's needed to make IronPython and IronRuby really slick! Complete integration into the Visual Studio IDE. Make them first class citizens. Macworld: "PowerPoint has caught up to Keynote in many areas and surpassed it in some. But Keynote’s workflow and overall feature set remain superior. Practically speaking, your choice of software probably depends more on the hardware you’ll be using to deliver your presentation (and the software installed on it) than on the features of your authoring program. For that reason, unless Apple releases a Keynote player application for Windows, which isn’t likely, PowerPoint may be a more sensible choice for many speakers." - Interesting wrap up. It looks like Apple has done a great job, as usual, of catching up to the leader, Microsoft in turn has responded. The idea of a Keynote player for Windows isn't such a bad idea, do one for Linux as well to cover all your bases. The bottom line: Keynote 4.5 mice, PowerPoint 4 mice. The Unofficial Apple Weblog: "Throughout the years, Mac OS X has definitely seen its share of changes. In these 7 years, OS X has been through 6 versions (7 if you include the first public beta version)." - Microsoft should consider releasing an update, not labeled as a Service Pack, every year. Something that improves on the Vista experience, be that performance, or a nice subtle UI improvement. It might make people feel a bit better about Vista given it hasn't been well received. Jay Kimble [via Jason Bock]: "I want to ask you to stop trying to tempt me to come join your company unless you want to make some changes to your corporate policy. I love a number of your company's products and really would want to work for you except for 1 thing: Redmond, Washington (or anywhere that isn't my chosen location)." - The best company I've ever worked for, Visio Corporation, allowed me to work remotely from 1997 to 2003. As part of the deal I had to fly to Seattle once a month for a week. It was a great arrangement. There were four of us with the same deal. It was the best time of my professional career and ended two and a half years after Microsoft acquired Visio because "We needed to be on the campus so we could have hallway discussions." Something most people in the world don't understand is this, Redmond is the center of the known Universe, so as an employee you need to be on site. It's true! Microsoft believes that so much they couldn't deal with the Visio team being in downtown Seattle so they moved the group to Redmond so the management didn't have to cross the lake for meetings. Visio was more progressive in 1997 than Microsoft is in 2008. One of these days a technology will be created that will allow people to communicate from anywhere in the world, their computers will be connected, they'll have fancy cameras built into their computers, and we'll have software that will actually allow you to see the person on the other end. Voice, video, and data will travel over some magic pipeline. I know, I know, it's a big dream, but maybe some day we'll be able to pull it off. Jay, don't hold your breath, you'll just pass out, get a massive headache, and nothing will change. Mini on the warpath, again! Mini-Microsoft: "Some weeks you just feel like Wile E. Coyote, beat up and dazed at the bottom of a canyon you just crash landed onto, wavering back and forth in the swirling dust while new knots grow out of your head and little concussion spirals spin above your black and blue eyes. And there's a shadow. A shadow that's growing bigger and bigger around you, and you wonder, where did that new Acme anvil get to, anyway, and what's that whistling sound?" Matthew Podwvsocki [via Harry Pierson]: "So, I can admit, I've been on a bit of a kick with compilers and such after my posts on DSLs, Compilers and the Irony of it All and Lang.NET and Rolling Your Own. Today is no different, but this time, I'm just intrigued by targeting the DLR instead of the CLR. Thankfully there are a few great references that people are doing right now for these little adventures. One day once I'm more finished with the deep dive into F#, I'll dig a little deeper." - Maybe someday I'll be able to take a look at this, right... Anywho, Matthew has a nice list of examples for building on the DLR. Mini-Microsoft: "Firing tens of thousands of Microsofties? Allow me to raise my hands in the air, wave them about, and yell out, Hallelujah brother, praise the RIF!!!" - Mini is sounding like the Mini of old. Calling, once again, for a reduction in force. The Unofficial Apple Weblog: "Actually, let's not do this. Let's realize that Microsoft is a company and Apple is a company, and while yes, in some fields they are competitors, let's just put the whole Apple vs. PC idea to bed. Guess what: a Mac actually is a PC. It's a very, very well-made PC (in fact, the best made, in this blog's humble opinion)." - Yes, the Macintosh is a great Windows box. Just check out the hardware, who wouldn't want that kind of power behind Windows? And, yes, I'm fairly certain the Linux crowd would be happy with a Mac as well, but I wouldn't want to do that to my Mac, it would be like putting a pig on lipstick. You read that right "Putting a pig(Linux) on lipstick(Mac)." Wired: "Johnson's comments seem aimed at responding to Yahoo's decision to adopt new severance plans earlier in the week. All the company's full-time workers who lose their jobs without 'cause' or quit 'for good reason' after a Microsoft takeover would continue to receive salary and health insurance for four to 24 months, plus other benefits." - This is going to get interesting. Microsoft is now a company that just follows the leader. They're losing to Google, so they're attempting to acquire Yahoo! Now we have news they've acquired Danger, which would seem to follow the tremendous success of Apple's iPhone and Google's Android. In response to the success of the iPod we get Zune. Microsoft is taking the lead in the high-priced gadget table market, but we don't yet know if it'll be a big hit. No, really, it is very cool, it's just not something common folk like myself would purchase. Will they ever get back to leading? Hopefully Ray Ozzie has some tricks up his sleeve. Charlie Calvert: "All the code that occurs in a dynamic block will potentially support dynamic lookup; even if the accessed members are not known by the C# compiler to exist, it will allow the code." - Does C# have to become a kitchen sink language? Why not let IronRuby and IronPython become the leaders in this regard and keep C# as clean as possible? One of the arguments presented for the inclusion of dynamic support is that PIA's can be expensive. If someone needs to use a COM component generate an assembly in a language that supports dynamic lookup and use that. C# doesn't need to be all things to all people. 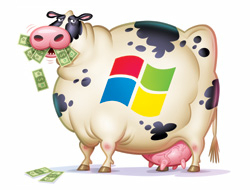 Slashdot: "If the marriage of Microsoft and Yahoo were to be consummated, GNU/Linux would be hindered, argues Roy Schestowitz. Yahoo's funding of open source initiatives would dry up." - Well, maybe, but why does that matter? It's open source, anyone can contribute, isn't that what makes it so attractive? A better argument against it would be lack of sense it makes for Microsoft to go into debt to purchase Yahoo! The Huffington Post: "Far too few, though, are writing about the impact of a sale on employees' work and morale. What analysts seem to forget is at the end of the day employees are what make a company worth anything at all." - In my experience I don't think Microsoft cares too much about the employee's in such a deal. The collection of 'old-timers' were encouraged, as is the culture at Microsoft, to move on, get a job in another group. I still believe on the whole Microsoft didn't really get Visio but they were certain they did and when the old-timers called bologna they were ignored and and seen as pariah, IMHO. I'm fairly confident you'll see HUGE layoffs; goodbye Sales, Marketing, HR, etc... The engineering teams are important for the time being to keep the ship afloat. The Visio team managed to retain 99% of the engineering team during the transition, one guy couldn't stand the thought of working for Microsoft and bailed to Adobe within a week. We were a total Windows shop, on the bleeding edge of everything Microsoft created, we rode their coat tails to success. It was intentional. The leadership at Visio was very bright and knew how to succeed. I can see mass defections at Yahoo! if this deal is approved. Why? Well, I work with a bunch of Linux/Open Source type folks that don't care too much for Microsoft and probably wouldn't work for them given the choice between Microsoft and, say, Google or another successful Open Source based company. That said, Microsoft turned Visio into a billion-dollar business, so they're clearly doing something right! And as I've said may times in the past, I'd go back to work on Visio in a heartbeat given the opportunity, and you can take that to the bank. Wow, that's a lot of moolah! Mini-Microsoft: "So, if your team is naturally at risk due to the acquisition I would start checking in on your local network and see what's going on elsewhere in Microsoft. If there's someone within Microsoft you've always wanted on your team that has some turbulence ahead due to the acquisition (yeah, I know, Ballmer's telling us "stay on target") check in with them and tell them the groovy things your group is doing." James Robertson: "Going back to my earlier post, this is exactly why there's going to be internecine warfare: the Yahoo staff ihas one technology stack, and the Microsoft side has another one. There will be enormous pressure to rewrite into the MS stack, but - the Yahoo side will resist, citing perfectly valid business cases along the lines of 'if it's not broke, don't fix it'." Dare Obsanjo: "Obviously, this is the top story on all the tech news sites this morning. My favorite take so far has been from a post on Slashdot entitled Implications for open source which is excerpted below"
Having gone through an acquisition as an employee with Visio I can tell you it's very exciting at first. Microsoft pretty much left the Visio gang alone for the first year, then moved their folks into key positions in the second year(folks that didn't understand the product or the customer base, IMHO), and in the third year began making radical changes. The entire team was moved from Seattle to Redmond, because it was too far for the Redmond folks to travel for meetings, all telecommuting employees positions were relocated to Redmond because we couldn't be as productive outside the halls of Microsoft, and the team size was cut way back by giving folks 3.0's, and through natural attrition. The development team is now a skeletal 20+, which probably isn't a bad thing given the maturity of the product that this juncture. Having said all that I'd most certainly love to go back to work on Visio given the opportunity, but that's not going to happen. Anywho, if this deal happens I can see layoffs happening, and we'll see attrition due to 3.0's (or their new counterpart) so folks will naturally begin to flock to other companies. I'm sure there are going to be many overlapping jobs; HR, Marketing, Sales, etc, that will be naturals for layoff, and there will be that certain type of Yahooligan that will absolutely refuse to be a Microsoft employee. I can't see wholesale change on the technological side, why break it if it works, but I can see a slow transition to Microsoft technologies. As Yahoo! begins to develop new applications I can see them being designed with Microsoft infrastructure in mind. It would make sense to not rock the boat too much or you'll see a mass exodus which would cause extreme pains for both sides as well as the end user. Don Box: "Java has achieved cockroach status and its inventors should be proud." Scott Guthrie: "Last October I blogged about our plan to release the source code to the .NET Framework libraries, and enable debugging support of them with Visual Studio 2008. Today I'm happy to announce that this is now available for everyone to use. Specifically, you can now browse and debug the source code for the following .NET Framework libraries:" - Neat. DouglasP: "We are looking for developers/testers to build a tool that I will roughly describe as 'Emacs.Net'." - Who care to work on Emacs? If you want people to come to work for you sell them on something new Douglas. Not rehashing the past, the ancient past to be a bit more accurate. Move on folks, we need the next big thing and something you compare to Emacs certainly doesn't sound very exciting. Now, it could be I've misunderstood the "Emacs.Net" label, maybe it's meant to say "We're working on something that will do for computing today what Emacs did in 1976." I dunno, your guess is as good as mine. I'm sure you've all seen the Ford Sync commercials. How many folks will see that and think "Cool, I can now use my iPod in my new Ford car!" I'll bet quite a few that aren't techno geeks. So, will an iPod work with Ford Sync? The answer is a surprising YES! PC World [via James Robertson]: "According to accounts published last month, XP SP3 will feature more than 1,000 hot fixes and patches that have been issued in the past three years, as well as at least four new features, some of which will be ports of Vista tools." - The Windows codebase will move forward, they can't turn back now. The idea that they'll port some Vista tools back to XP seems reasonable. They'll get more time to bugfix Vista and get folks using XP acquainted with Vista features. It's a short term fix. When Vista is solid they'll shut the door on XP. MSDN: "Attempting to render WPF pixels over Win32 leads to undesirable results, and is disallowed as much as possible through the interoperation APIs." - Must read this. Dennis Chung: "Wow. Take Windows Server 2008 Server Core + PHP + IIS7 + MySQL + WordPress, mix them together, will they blend well and work out as a nice concoction? Matty challenged me to this blend, and guess what, we have a powerful cocktail to offer after all!" John Lam: "Well, lots of other folks beat me to the punch about the announcement, but I was busy installing the product yesterday :) It's a popular product *inside* the company as well, and it took about 5 hours to grab from our internal share ... You can grab trial copies from here, and you can download the free (Express) editions from here." - John also links to a poster for C# keybindings, some of us still use an old outdated language called C++, so here is the poster for C++ keybindings. James Robertson: "If they were smart, they would break the company into multiple pieces, and let each one try to get back to being lean and hungry. I don't expect to see that anytime soon, though." - James is of course talking about Microsoft. They are now the IBM of the 80's. Dare Obasanjo: "n thinking about the Google OpenSocial Announcement I realized how much some of Google's recent moves remind me of Microsoft of old " - It's strange hearing this from a Microsoft insider that's on a team dedicated to web stuff. From the outside what I see is Microsoft trying to become Google. So what does that mean about Microsoft? Are they forever stuck in their old ways, and they can't see the forest for the trees? Why aren't you running Vista? The other day the VP of our little software division came into my office while I was building some code, in Windows, I'd just added some functionality to on the Linux side of my universe; making sure I didn't break anything, and he says "I'm surprised you're not running Vista?" to which I replied "I have a Mac, I don't need Vista." The reply seemed to satisfy him. That's weird, domain name discrimination. Michael Geary: "I’ve noticed that it is impossible to log in as a registered user here at mg.to using Internet Explorer, even though other browsers work fine." - That's a strange bug, isn't it? I know a team that'll volunteer! Seattle Times [hat tip Tommy Williams]: "It would be the company's first significant presence on the west side of Lake Washington, not counting office space it gained by acquiring Visio in 1999 and, more recently, Pioneer Square-based aQuantive." - I have no doubt that the remaining Visio "old timers" would love to be back in downtown Seattle. The move to Redmond ruffled a bunch of feathers back when it happened, especially for those that lived in Seattle, or worse yet, on one of the islands in the sound. Strange how this is playing out. They had World Trade Center 1 and an option on World Trade Center 2, and gave them away. Those two buildings were absolutely beautiful, and had fantastic views of the Puget Sound. Windows losing ground with developers? The Server Side.NET: "Microsoft is not dead, and it is not dying. Rather, the company's decline in market share is a runny nose." - I can definitely see this happening with the focus clearly on web based stuff. If you're doing client side applications Windows is pretty hard to beat, unless you're doing Mac applications, but the server side has a ton of dynamic language support with frameworks that allow folks to be highly productive and it's all free; Ruby + Rails, Python + Django, etc... On Windows we have those two plus we have ASP.NET and [insert your favorite .NET language here], but is that really an advantage? In short No. The real answer is Yes and No. For me it would be easier to use ASP.NET and C# because I already have experience with ASP.NET and C# is super easy to transition to because of my C/C++ background. Sure I could pickup Ruby and/or Python, but I'd need a bit of time to become as proficient with it as I am with C/C++. Who knows in the end it may be well worth my time to be a Ruby/Python dude, only time will tell. Hey, have you looked at C#'s upcoming LINQ implementation? Check out Scott Guthrie's series on LINQ; Part 1, Part 2, and Part 3. It's going to make life more productive for the C# developer, that for sure.